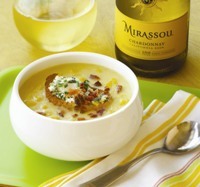 To start off a great meal, or even as a light main dish, try Aida's version of creamy corn soup topped with an indulgent cheese toast and crumbled bacon. Paired with a glass of crisp Chardonnay from Cali­fornia's Mirassou Winery®, this is a perfect pairing for any autumn evening. 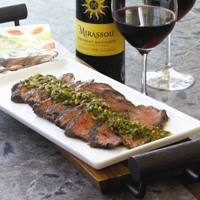 Try topping a grilled hanger steak with a colorful and spicy basil chimichurri, and pair with a glass of Mirassou's lush Cabernet Sauvignon to create an unforgettable fall flavor combination.